402 SHIPS CALLED IN OAKLAND DURING THE FIRST THREE MONTHS OF 2017, DOWN 5.6 PERCENT FROM A YEAR AGO: At the same time, those ships carried an average of 8.4 percent more containers in and out of Oakland. Increased imports through Oakland reflect return to normal trade patterns following Lunar New Year. Oakland’s numbers highlight a shipping industry effort to consolidate more cargo volume on fewer ships. Consolidation of cargo promises benefits reduced operating expense and a reduction in emissions. Port of Oakland import cargo volume increased 19 percent in March over 2016 totals, according to figures released by the port. The the results contrast sharply with a 9.2 percent decline in February shipments to Oakland. Total loaded container volume – imports and exports – was up 9.3 percent on the month. Increased imports reflect a return to normal trade patterns following February Lunar New Year celebrations in Asia. Many factories shut down for the holidays, curtailing shipments to the US. According to port figures, 402 ships called in Oakland during the first three months of 2017. That was down 5.6 percent from a year ago. At the same time, those ships carried an average of 8.4 percent more containers in and out of Oakland. The numbers highlight a shipping industry effort to consolidate greater cargo volume on fewer ships. 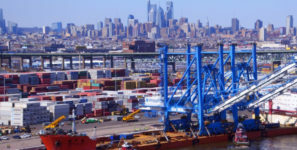 According to the port, the trend promises three benefits: reduced vessel operating expense for shipping lines; less demand for berthing space at marine terminals; and a reduction in diesel emissions at port thanks to fewer vessel calls.